Are you a wonderfully talented performer who would love to perform on our stage? Well we’d love to hear from you! Our shows take place at The Admiral Bar, 72 Waterloo Street, Glasgow. This is a lovely wee room situated three minutes walk from Glasgow Central Train Station. The room holds 120 people. The venue is downstairs and unfortunately there’s no lifts so no disabled access (sorry). There is a changing room at the back of the venue. This is shared between all performers but the comedians normally just use it for hanging a jacket. The stage is approximately 20cm off the ground. The roof is about 8.5 feet high, so very low. Nothing can be attached to the ceiling. There are no fire acts allowed in the venue. We have a sound guy. If you need props, we can provide chairs. There are only a few tables so if you need a table, please bring your own. Music acts will need to bring their own DI Box. Our standard show has 3 comedians, 2 burlesque acts and 1 magician. Disclaimer: We are not a comedy chain who allocates time slots to names in some random order. 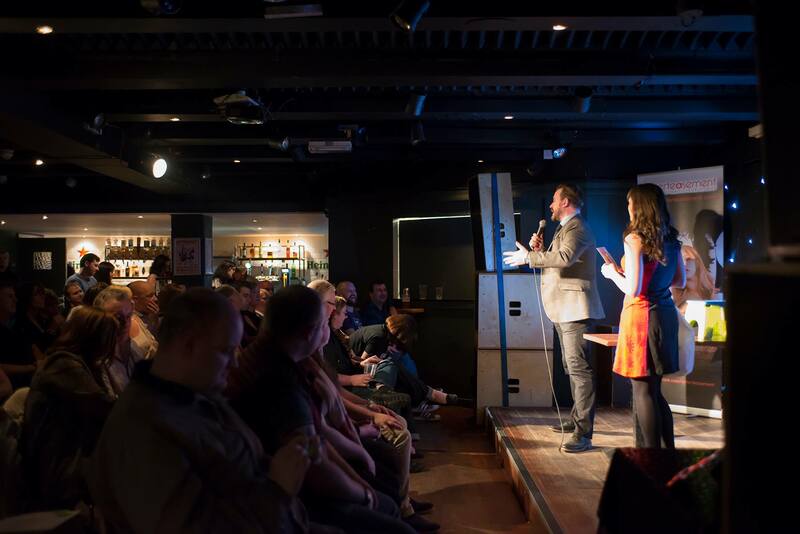 Our owner, Chris Dinwoodie, is a comedy magician who has been performing on the Scottish Comedy Circuit since 2007. He knows virtually everyone on the circuit and if he doesn’t know them he’ll know someone who does. Please don’t email saying you’re an amazing headliner when you’ve been going for two minutes, it’l just waste both of our times. Our show has one of the best reputations for comedy in the whole of Scotland. Nice room, comedy savvy audience, stage, good sound system etc. If you’re a Kevin Bridges / Frankie Boyle and you’d like to jump on then please get in contact. (you’d be fulfilling one of our bucket list items) We’re happy to keep this a secret. Pro acts from down south already gigging in Glasgow and looking for the double up. We don’t have any 5 or 10 minute open spots – sorry. Dark comedy – racist, angry atheists – they don’t go down well. Joke thieves – comedy is an art, art is unique, our comedians write their own material. Burlesque performers, Enterteasement needs you! There about 10 professional burlesque performers in Scotland and we’ve used most of them several times. To keep things fresh for our audience we’re always looking for new faces to come and join us. We’ve had acts from Bristol, London, Newcastle travel up for our show and always had a good time. We can normally offer a spare room in our flat and there’s a double up opportunity with another burlesque club close by so the fee isn’t too bad. Overly messy acts – champagne acts are great to watch, but not fun to clean up and the venue owners don’t like them. Our magicians have included Colin Cloud, Alan Rorrison, Paul Nardini, Ian Kendall, Fritz, Dee Christopher, Kieran Johnson to name a few. If you have a 15 – 20 minute set, please get in contact – we’d love to hear from you. Always on the lookout for talent and am particularly looking for acts who are a little bit different. We advertise as a comedy magic burlesque but we’re really a variety night and always love to have something a bit different on the night. Bands: Bands take up Stage space and we don’t have a lot of it to start with so unfortunately at this time I’m not looking for any bands. Hosts, compere’s and MC’s who aren’t comedians: There are a lot of people who would like to ‘try their hand at compering’ and I’m sure you’d be good at it but if you aren’t a comedian it’s not what I’m after I’m afraid. Scotland has some of the best MC’s in the world and I’m happy to use them. Pole Dancers: The ceilings are too low for a pole – sorry. Open Spots: Sorry, we don’t have any 5 or 10 spots available. We’re a premium Saturday night show.